Hey, Nate here! 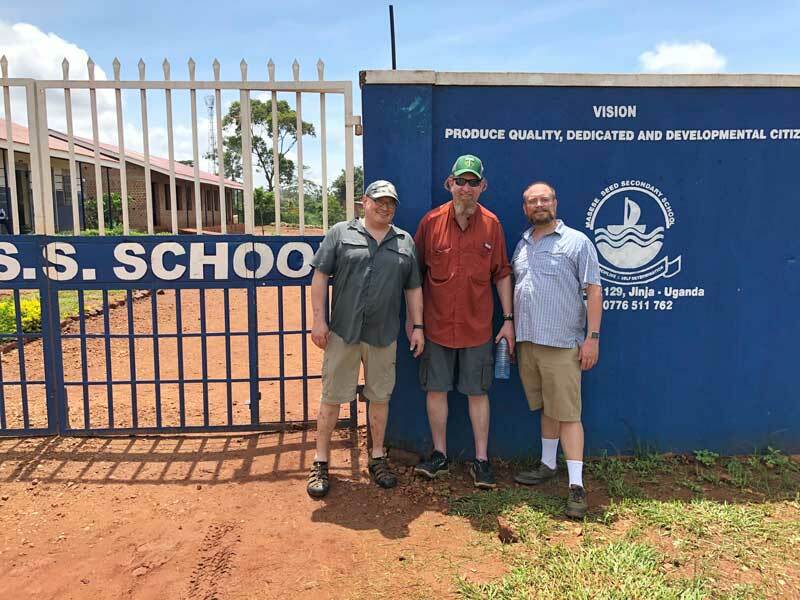 After visiting Uganda in 2003 and working with Patrick over the past 14 years, I was very excited to make my first trip back to this small African country halfway around the world. We have many programs and partners there and planned to do as much as we could on our short 8-day trip. Travel time is about 22 hours, including a few hours in the Amsterdam airport. Patrick, Albert and I, along with 9 checked bags packed with supplies and gear (thanks to your donations), made it safely to the Entebbe airport. We were met at the airport by one of our Ugandan partners and a rental van, which served as our transportation for the week. After spending the first night in downtown Kampala we made the trip out to the Jinja district, where our projects are focused. Jinja is about 50km (~30 miles) from Kampala, but it took over 3 hours, due to traffic and road conditions. It is the rainy season in Uganda, which means about 30 minutes of rain each morning. It slows things down, but also keeps the country green and beautiful. Summary: Many people have asked me how the trip was. It is a hard question to answer; a few words that come to mind are exhausting, amazing, and life-changing. It was also frustrating knowing how little we could do while we were there, but we still know that everything we makes such a big difference. Trying to convey how little these people have is the hard part, but at the same time, they are so full of joy. Many of them do not know where their next meal is coming from, but they always have a smile and kind word to share. Uganda has come a long way since my last visit, but still has so far to go. We have some great Ugandans that we work with. They are the ones that keep things going while we are not there. Building those relationships is so key when running projects halfway around the world. Even though the schools in the Jinja district, where we are focused, are publically supported, the parents are required to pay fees that many cannot afford. We were able to meet up with several of our scholarship students and their parents to let them know their next term had been paid for. The parents were extremely thankful that their smart, motivated students don’t have to worry about school fees. We had some really bright backpacks full of school supplies and other gifts for each of the students we support. While there we were able to visit a few schools and meet with the headmasters. They are really trying to make a difference, but resources are very limited. The Masese Seed school we visited is only 2 years old but is growing fast. The staff was excited to show us their sparse ‘science lab’ but are discouraged by how hard it is to get the supplies needed to run it. The enrollment for one school we visited has dropped from 900 to 600 students because the school no longer had funds to provide free lunch. The student’s lunch usually consists of porridge cooked over a fire. Without lunch, the parents didn’t see a reason to send their children to school. We were also able to meet with some top people in the Jinja education system. We are hoping to continue these relationships, especially in regards to the hygiene projects discussed below. We took a wide range of supplies with us, but none were more important than the diapers we took to the Home of Hope for disabled children. They use cloth diapers, but during the rainy season, and with 60 children under their care, it is hard to dry them fast enough. We also purchased 2 tons of food (rice, beans, flour) locally to distribute to the slums around one of our partner churches. The women were asked to line up for food but were so worried they wouldn’t get any that it became a little chaotic. With the added excitement of having us there, we decided to leave while the local pastors and leaders handed out the much-needed food. Everywhere we went we were able to distribute toothbrushes, toothpaste, basic school supplies, and soap, thanks to more generous donations. It was pretty humbling to see how excited people of all ages were to receive simple items we take for granted each day. Many of our partners there were also provided with iPhones, laptops, and even a projector. One of them is taking courses in digital marketing but only had a very outdated Android smartphone to work on. Technology is very limited in Uganda. We saw perhaps one computer per school visited. Our donated sewing machines were also greatly appreciated. They were given to ladies who will use them to create a sustainable environment for their families and communities. As a man, it is uniquely difficult for me to explain how important our reusable sanitary pad project is. Everyone we talked to expressed what a huge impact menstruation has on the young women there. They do not have the education or resources to even know what is going on with their bodies, let alone how to properly take care of it. Many girls drop out of school because of their periods. We were shown the types of rags, sponges, and leaves that are used in place of pads. After the female instructors did a session at each school, we were able to distribute reusable sanitary pads to the students. Many of the teachers asked for them as well. The So Sure pads come in packs of 2 and can be washed and reused for up to a year. We are now budgeting $5 per girl after finding out that once you get to the more rural areas they do not even have underwear available. It is amazing how $5 can truly change the future for these young women. Hopefully this brief report gives you an idea of what we are doing in Uganda. It is just a glimpse of what we did while we were there. The most important thing is that the work doesn’t stop after this trip. We are continuing our projects and still need your support. Please consider making a monthly commitment to Patrick’s Children. Thank you! I will finish up with a gallery of children from the trip.